Cytometric studies utilizing flow cytometry or multi-well culture plate fluorometry are often limited by a deficit in temporal resolution and a lack of single cell consideration. Unfortunately, many cellular processes, including signaling, motility, and molecular transport, occur transiently over relatively short periods of time and at different magnitudes between cells. Here we demonstrate the multitrap nanophysiometer (MTNP), a low-volume microfluidic platform housing an array of cell traps, as an effective tool that can be used to study individual unattached cells over time with precise control over the intercellular microenvironment. We show how the MTNP platform can be used for hematologic cancer cell characterization by measuring single T cell levels of CRAC channel modulation, non-translational motility, and ABC-transporter inhibition via a calcein-AM efflux assay. 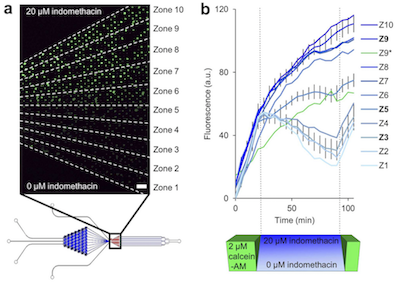 The transporter data indicate that Jurkat T cells exposed to indomethacin continue to accumulate fluorescent calcein for over 60 minutes after calcein-AM is removed from the extracellular space.